If you like ketchup as much as I do, you’ll love this recipe for homemade ketchup. It’s packed with so much aromatic goodness that you’ll wonder why you ever used store-bought. It’s the best way to jazz up a burger and fries and feel good all the other times you reach for ketchup! Toss all the ingredients into a large saucepan. Place over medium heat and bring to a simmer. Continue cooking, stirring occasionally, until the mixture reduces one-half, about 30 minutes. Here’s a trick to determine whether a liquid has reduced by half. In this recipe, stand a wooden spoon in the pot and mark the ketchup’s level on it. Use that mark as a reference to know when the mixture has reduced by half. Cool the ketchup to room temperature (an agitated hot liquid always expands violently; it’ll explode all over your kitchen and make a huge mess), and then purée the mixture in a food process, blender or in the pot using an immersion blender. Get some French fries and start dipping! If you’re a fan of garlic, toss a whole head of peeled cloves into the pot. After the sauce is reduced, try adding your favourite hot sauce until the ketchup is pleasingly spicy. This classic sauce turns anything into instant dessert with its deep caramel flavour. Every time I transform bland white sugar into rich, slightly bitter caramel I get excited. I think it’s magical how much flavour a simple cooking process can add! Your family will too. Rhubarb chutney is a tasty condiment side-kick for whatever hits your grill this season. Meat, fish or fowl – even grilled veggie burgers – get a big bright boost from this balanced classic. Rhubarb’s sour tang is mellowed with sweetness, fragrant spices and spicy heat in this make-ahead topping. 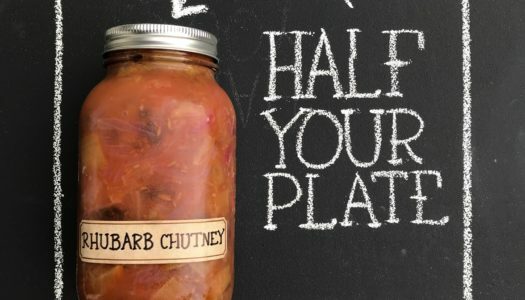 You can perk up more than Half Your Plate with this fragrant chutney!